Perhaps that was my first ever inkling of how much the French enjoy their comic books/graphic novels. 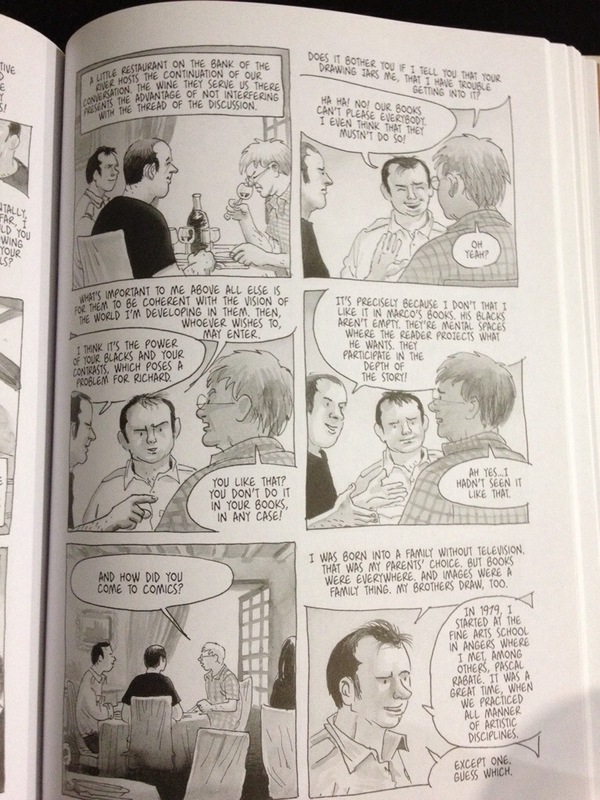 That in my first few weeks of learning French in university the term ‘Bande dessinée.’ was introduced. I’ve also taken some basic Spanish and Italian classes (yeah I lack commitment) and do not recall learning the terms for comics/graphic novels in those languages. I was forced to learn Chinese for years in Singapore (from first grade through to our equivalent of high school) so I do sort of know that 漫画 manhua is the term – although I had to google it cos I forgot!. But bande dessinee. It is a term I remember. And not just because my teacher was a cute young Frenchman. I’ve read some French (translated into English that is – my knowledge of French is way too basic) graphic novels like The Extraordinary Adventures of Adele Blanc-Sec by Jacques Tardi, Epileptic by David B, and of course Tintin and Asterix ! Plus, did you know that Marjane Sartrapi’s Persepolis was published in France before it was translated into English (she lives in Paris)? But it was only in The Initiates that I understood how wonderful the variety of graphic novels in France is – and wished that more of them were translated into English. 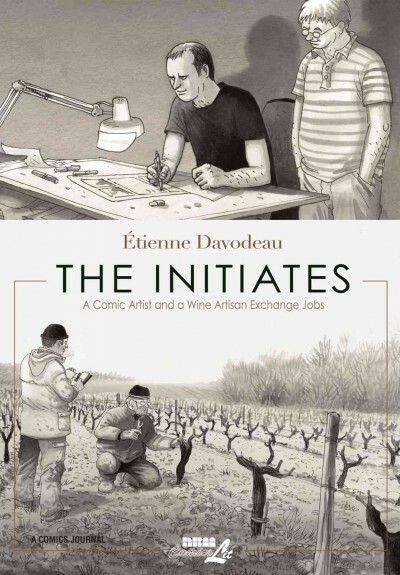 The book’s premise is simple: a winemaker (Richard Leroy – an actual real-life winemaker who makes chenin blanc and is apparently very respected in the field) teaches a comic artist (Davodeau) about wine-making and vice-versa. Davodeau tags along as Leroy prunes his vines, ploughs the fields, works the harvest through the year, and lovingly nurtures his vineyard. And of course, the two of them drink plenty of wine in an attempt to hone his palate. Leroy on the other hand reads up on graphic novels (an extensive list of both the comics read and the wines drunk is thoughtfully provided at the end of the book) although some put him to sleep, visits Davodeau’s publishing company, attends the French version of Comic Con, and meets other comic artists. But the best part about this book were the conversations about wine and comics, usually over a long meal complete with wine (and some of the best parts were when Leroy peruses the wine list and tells the waiter “I’ll have water”, perhaps the ultimate insult from a winemaker!). The tones are muted, the mood generally quiet (nothing terribly exciting going on here), and when I first began this book, I was a little worried that this would be like an instruction manual, that we would learn this this and that about winemaking, and here, this is how a comic artist works. But it is in no way like that at all. It is informative, sure, but it is also thought-provoking. Not just about the art of comics and winemaking, but on the meeting of diverse people and having conversations about books and wine. It helps that Leroy is a bit of an eccentric character, and the two of them have a great friendship. Davodeau said in this interview with Comic Book Resources that he and Leroy had been friends for a few years when Davodeau learnt that Leroy, at age 50, had not read a comic book before and proposed this idea. I’m just so very glad that Davodeau and Leroy got together, and that Davodeau took notes and sat down and illustrated and wrote this fantastic book. It was two years of hard work, both in the vineyard and in his studio. 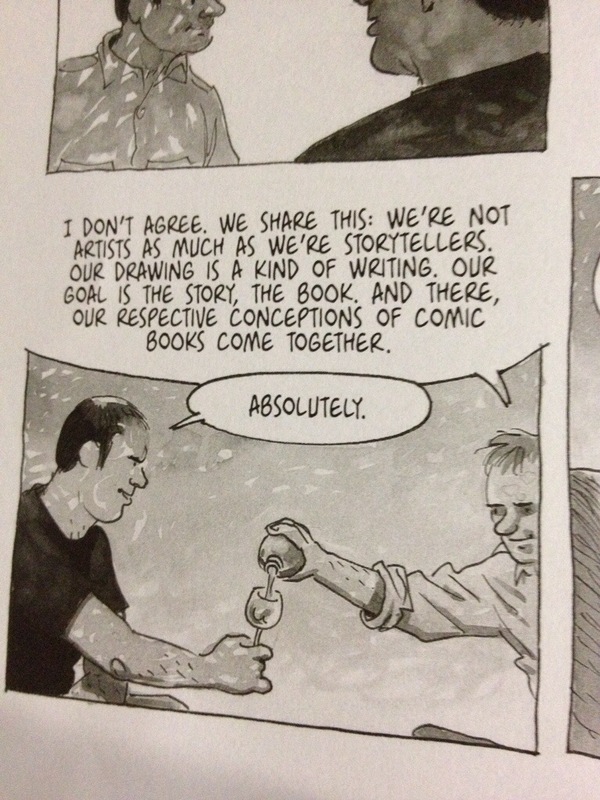 It makes the reader want to sit down and read more graphic novels, preferably with a lovely glass of wine. And so it’s a perfect Weekend Cooking book! Conversations about winemaking and books! Ooh you will be in France? How wonderful!! 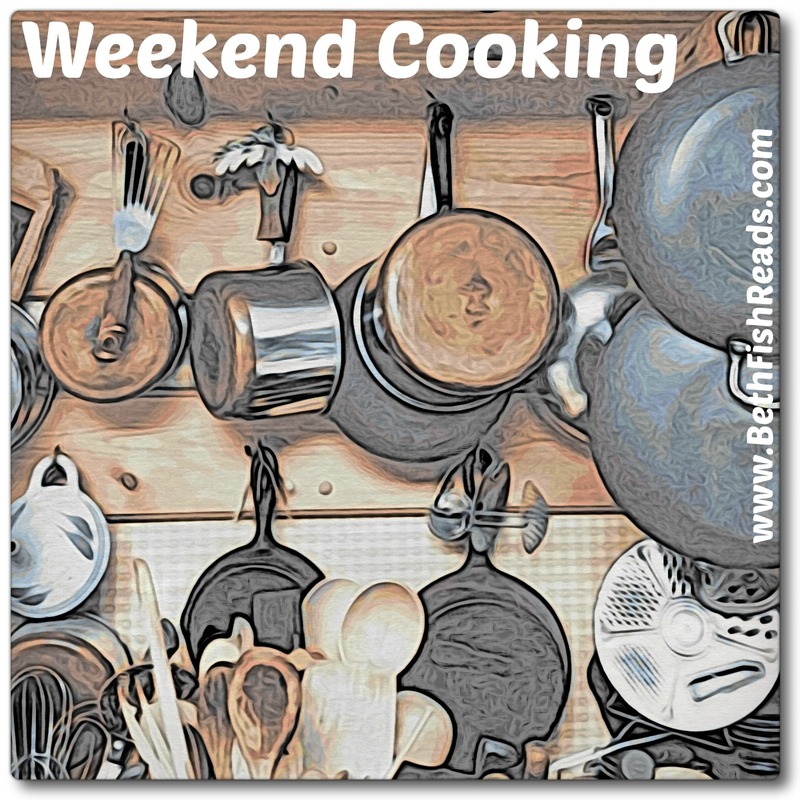 This is the perfect Weekend Cooking book! I loved reading the page you shared. Now I think I have to track this one down. I would also like to see the list of books included in the back. Unfortunately most of the books listed were not translated into English. But one can always hope! You are correct, this fits the bill for Weekend Cooking perfectly. this sounds like a wonderful story, but also a chance to learn about both fields. Thanks for sharing this.